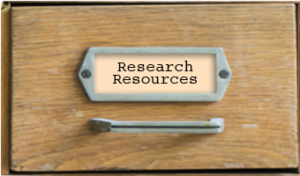 These items and more are available at the Blanchard House. We also often have them for sale at events around the area. If you’d like to order from us, please send us an email with your contact information and the items you’re interested in. We will contact you to make arrangements. For any orders being shipped, please add $5.00 to cover packaging and postage. – by David McCord, et al. With nearly 1,000 photos and over 300 pages, the 100-year history of “Michigan’s Greatest Outdoor Event” is chronicled in this book, written exclusively for the Ionia County Historical Society. 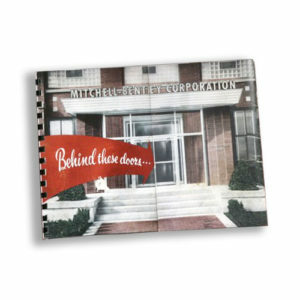 The pages are a full 8.5×11 inches. Available in softcover for $30, and hardcover for $45. Please add $5 for shipping, or pick up your copy at the Blanchard House. 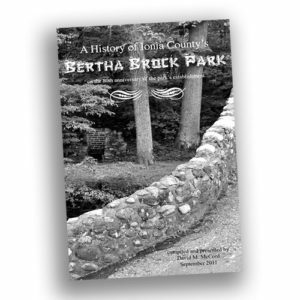 This booklet was compiled on the event of the Park’s 80th anniversary. Often cited as one of Michigan’s most beautiful parks, including a full four seasons of enjoyment. 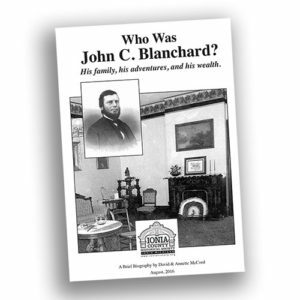 Who was John C. Blanchard? 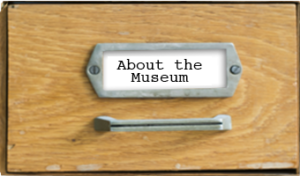 This little booklet answers the question most often asked by visitors to the mansion. His life is described from boyhood in the New York wilderness to his rise to political and financial prominence and his “declining years” to his death in 1905. 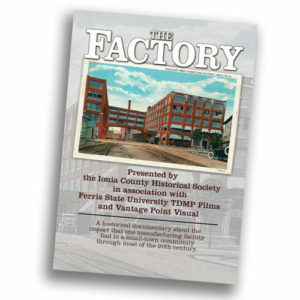 This DVD contains the 20-minute documentary on the history of Ionia’s major employer for nearly 100 years, from reed furniture to cutting-edge automotive manufacturing, the plant eventually housed the world’s larges compression molding operation. Produced by students at Ferris State University and shown on Public Television throughout the country. 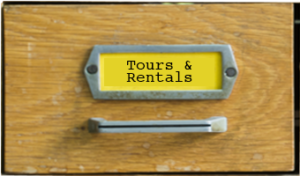 This booklet is a collection of information from city directories, newspaper accounts, insurance maps, and city records that describes Ionia’s downtown business district lot-by-lot through the past 180 years. This high-quality heavy blanket depicts images of nine of Ionia’s major historic landmarks. Measuring approx. 4 x 5 feet, it’s available in shades of gray or gray-and-burgundy. 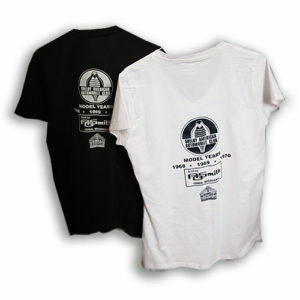 $75.00 each – includes a flier with information about each historic site. 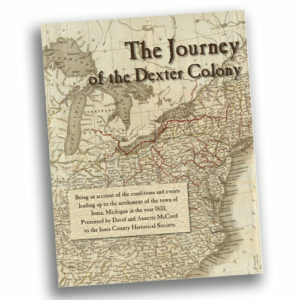 This softcover book recounts the history of the settlement of Ionia, Michigan, from the concept to reality. It follows the preparation, journey, and arrival of the original 63 settlers in 1833, with plenty of pictures, maps, and documents. 8×10 inches. This is a DVD copy of film footage found in the ICHS archives. The full-color movies were shot in 1939 as a promotional film for the community. The narration that went with the film has been lost, and the clips reproduced here are not edited. 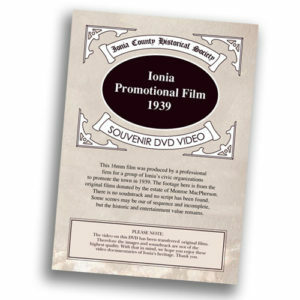 Still, it’s a fascinating look at Ionia in 1939 – people, businesses, institutions, and local scenery. Winter in Ionia is documented in the DVD with two short films. One is a promotional film from the County Road Commission showing snow-removal challenges in the blizzard of 1936. 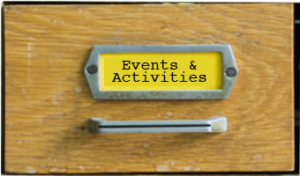 The other is the hugely popular 1941 Winter Festival which drew crowds of over 10,000 people to Bertha Brock Park for the festivities. This DVD includes old movie clips from two events in the ’50s: a JayCees Home Show and the Ionia Free Fair. There is no sound track, but the scenes of the “mid-century lifestyle” are entertaining and nostalgic. In 1973, Ionia celebrated it’s 100th anniversary of its incorporation as a City. The DVD is a copy of a 16mm film produced by Monroe MacPherson in commemoration of that event, a prequel to the later “150 Years” video. Movie footage from the 1973 Ionia City Centennial has been transferred to this DVD. There is no narration, but the films of the community’s celebration include parade and pageantry in downtown Ionia. This DVD video is copied from a 16mm film produced and narrated by Monroe MacPherson on the occasion of Ionia’s sesquicentennial in 1983. 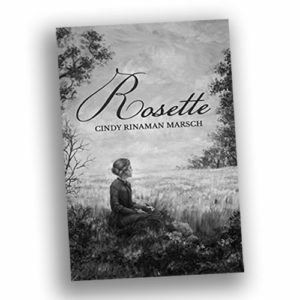 This softcover book relates the story of Rosette Cordelia Ramsdell who lived near Lyons, Michigan in the 1850s. In the voices of Rosette and her family, the novel traces how we both choose and suffer our destiny. It brings us enduring themes of friends and family as they make the most of the harsh American pioneer life. A standard poker deck with a full-color photo of the Blanchard House on the card backs.